A new condiments organiser range from FEM features inter-connecting units designed to show condiments, straws, napkins and chilled garnishes in an attractive, eye-catching display. The four organisers, with varying sizes of trays, domes and pans, offer caterers the perfect way to both display and organise their condiments offering. The modular units all have rubber linking feet so they can be fastened together to create larger displays. The feet also prevent the units slipping, creating a more stable display. 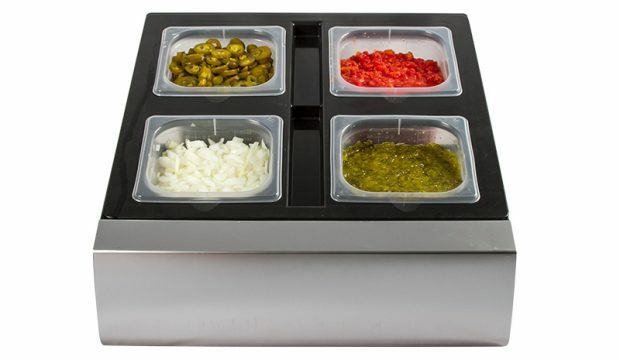 The Modular Condiments Organiser range is manufactured by San Jamar. The four models in the range are the Modular Modpan, the Modular Organiser, the Modular Mini Dome and the Modular Straw and Napkin Combo Dispenser. They are made of ‘high impact plastic’. The Modpan is divided into four holders, each of which can accommodate a 1/6 GN pan. It is designed to hold a range of salad items or garnishes, such as chopped tomatoes, onions and cucumber. The Modular Organiser has both shallow and deep trays for items such as sugar sachets, milk cartons and stirrers. The Modular Mini Dome has four separate compartments for dry or chilled condiments, or garnishes such as lemon slices. The fourth unit in the range is the modular straw and napkin combo dispenser. It is very compact and, by offering a two-in-one, over-under design, makes the most effective use of space. The Modpan, Organiser and Mini Dome all use the same square base unit, measuring 318mm wide by 475mm deep and 473mm high. Meanwhile the Straw and Napkin Dispenser is available in two sizes, 239mm x 346mm x 563mm for an interfold napkin, and 239mm x 347mm x 563mm for a fullfold.